Downtown Manama, the capital (which I keep wanting to call "Manama-na" after the Muppets song), consists of a very modern city, right next to an ancient one. The modern city has hotels, banks, and all the required high-rise office towers. The ancient city is really a giant bazaar, (called here a "souq"). The buildings there look a little older and a little the worse for wear. Extending over many blocks, it is a very large area, where the distinction between "street" and "alley" is, to say the least, a little fuzzy. In some cases, the awnings of the buildings on each side completely cover the passageway, so the distinction between "alley" and "hallway" is a little fuzzy. 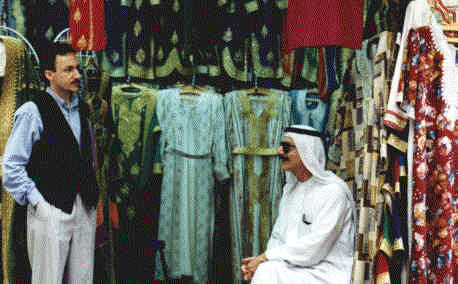 Throughout Bahrain’s history it has been a trading center (Actually, they would claim it has been a trading centre. The British influence here is strong. ), where east and west meet. These folks are definitely carrying on the tradition. Although what used to be the silk and pearl trade has of late become the polyester and fake rolex trade. And the electronic toys trade. Et cetera. A large proportion of the stores sells fabrics, and another large group sells gold jewelry. Many of the shops open to the "street", and those that don’t often have tables set up out in front. Barter is the order of the day. You do not pay list price for anything. The guy wanted three dinars for my wonderful beat-up old Alladin’s lamp (actually it’s an Alladin’s coffee pot, but you get the idea), but I finally got it for two. That’s a little over five bucks. And then there are the food blocks. What an experience! Wonderful smells! 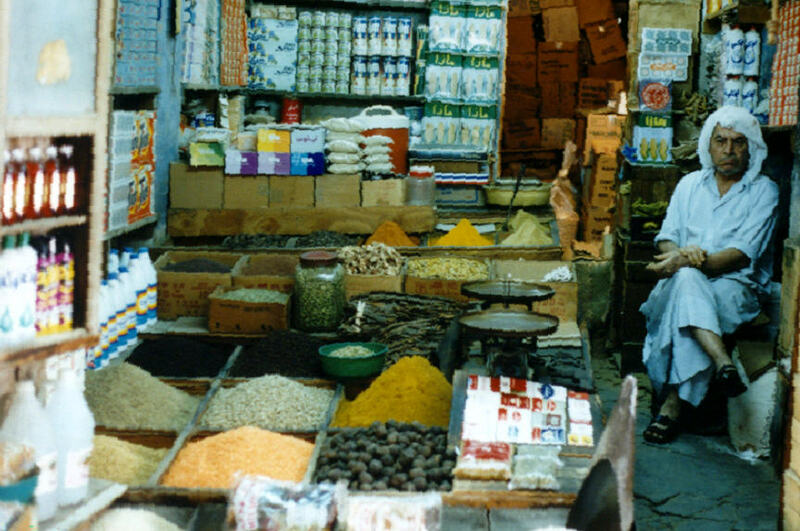 Spices are sold in bulk. In front of each spice store is a table with a set of small mountains of finely-ground powders, in every imaginable color. Each mountain is a different spice. There was a white mountain, a bright red mountain, a green mountain, a sort of cappuccino-colored mountain, and so forth. Want to buy some spices? Tell them how many grams you want, and they’ll scoop that much out of a mountain for you. And the interesting smells come from the dust. I described my pleasure at seeing and smelling this to a Bahraini friend of mine and he observed that in Bahrain they use spices in much greater quantities than in the U.S. This is of course true. Where in the U.S. we would sprinkle a small bit of cumin out of a can with holes in the top, they will spoon the stuff on most generously. There were also booths where you could buy every imaginable kind of nut (I bought some peanuts from China. They taste different), and some that sell dried green tobacco leaves for your hubble bubble (the Bahraini version of a water pipe).